The South Australian Veterinary Emergency Management Plan (SAVEM) has been created to enable an effective response to emergency incidents involving livestock, companion animals and wildlife. Prompted by the 2009 Victorian bushfires, the plan is now officially recognised as part of the South Australian government’s emergency management plan. 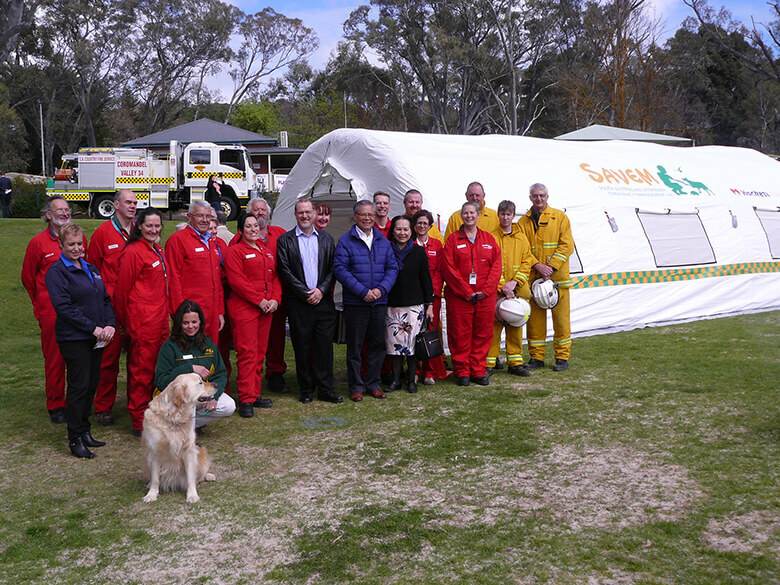 Covertex supplied SAVEM with a quick-to-deploy Major Incident AirShelter (MIAS), enabling them to have their own self-contained work space in an emergency response and providing a quieter and safer environment for the animals. Designed for first response emergency operations, the Covertex AirShelters are highly robust, fully inflatable structures that are rapid to deploy for use in diverse climates and conditions. Extremely lightweight and compact, they provide an instant self-contained solution at any location, enabling the response team to work safely and effectively. SAVEM’s Dr Rachel Westcott said, “We can deploy very quickly into an area and have our own dedicated space to set-up straight away, with our control centre and treatment centre in the one structure. We can treat and triage animals and then arrange to have them sent off-site to other veterinary clinics. The big advantage is not having to share a staging area with other emergency responders”.